Once again, the public demands more news about monkeys and I, as the theoretical cigar-chomping, hooch-swilling, skirt-chasing, cholesterol-lowering-medication-taking, underpaid and overworked 1930s-style bureau chief of the fictional yet highly respected Monkey Action News Team, will fling it with both hands. While “Monkey Squad” sounds like the name of an entertaining movie about a group of plucky chimps secretly trained to operate behind enemy lines during World War II, the correct name of my group is the Monkey Action News Team and I summoned my culturally diverse squad -- Johnny, Rico, Lulu, Jaafar, Kichiro and Toots – to my office for a briefing. Here’s what they came up with: Yes, someone discovered a mummified monkey in an old department store. As many media organizations, including LiveScience.com, reported, a worker renovating a 100-year-old department store in Minneapolis said he found the mummified remains of a monkey in an air duct earlier this month. How it got there was open to speculation. 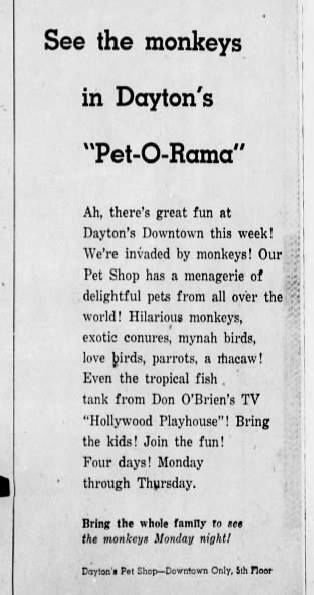 Several readers on a Facebook page discussing the story found ads from the ‘50s and ‘60s promising “hilarious monkeys” for sale in the store’s pet department, along with tropical fish and exotic birds, though none of the latter were found mummified in the air ducts during the latest renovation. One man, the mayor of a nearby town, claimed his father stole a monkey from the store in the 1960s and, after it went nuts, he took it back and let it out on the escalator. In theory, that monkey could have made its way into the duct work and expired. I think a question more important than how it got there is why did no one smell a dead monkey in the duct work of a department store at any time after the monkey’s demise? Or, if they did, how was it explained away? We may never know the answer to these compelling questions. But, rest assured, the Monkey Action News Team won’t give up trying to find it, not even Johnny, that snot-nose punk.